The wallpaper was made colourful to complement the vibrant and cheerful colours in L's photos. The pictures featured on this wallpaper are taken from the photobook, L File No. 15. You can find the scans here (you will need to be a member of the LiveJournal Death-Eyes Community to access the entry). 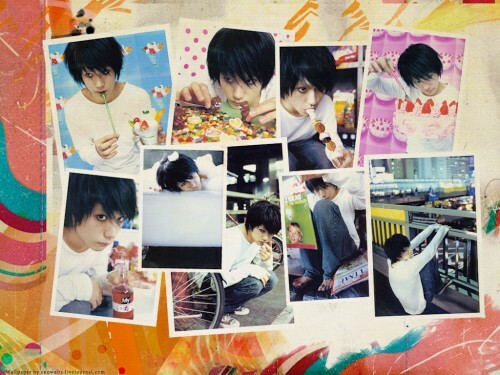 L is starred by Matsuyama Ken'ichi in the live-action movies of Death Note. Very lovely. The colors definitely suits light-hearted mood of the photos. Oh Kinichi Mutsuyama is soo amazing as L.He's very good actor.And this wallpaper is too very cute.I love it. I love L! Thank you! it is good. he's cute. he looks like L lawliet. Matsuyama as L is soooo cool and perfect! The last coment is mine! Thanks for sharing thi AWESOME, INCREIBLE, NICE, COOL pic!